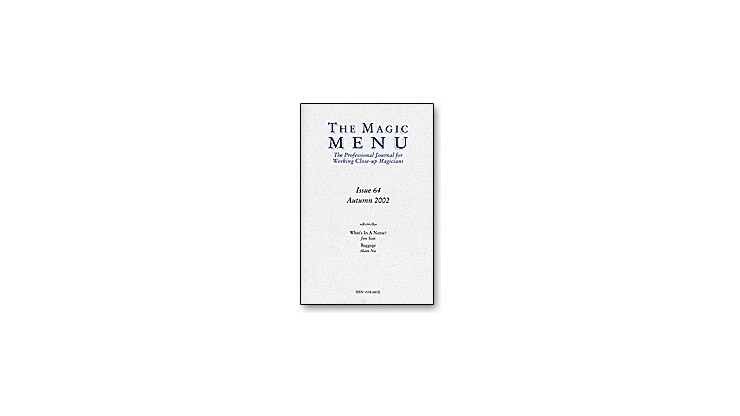 For over ten years, Jim Sisti's "The Magic Menu" has held a unique position in magic as a consistent, reliable source of information for working professional restaurant and bar magicians, written by working professionals. Each quarterly issue is packed with information for the working performer, with helpful articles, honest and concise reviews and, of course, original magic from established professionals and unknown pioneers making their mark. Issue 64 is more of a "mixed bag" than previous issues, with various perspectives on a large variety of topics of interest to professional workers. Coeditor Jim Sisti tackles the thorny issue of just what to call what it is that professional performers do. Alain Nu then begins a new series of columns discussing various ways to carry around all of our magic "baggage." 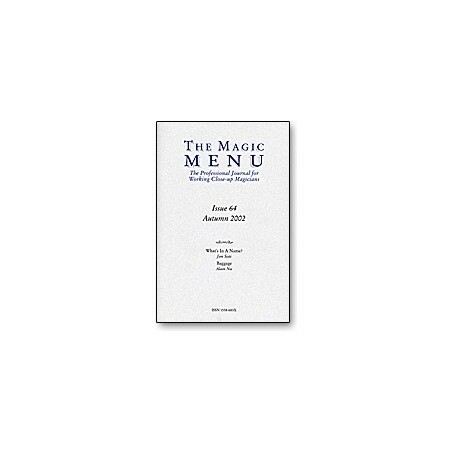 Scott Davis joins "The Magic Menu" staff in this issue and will be weighing in on the all-important topics related to marketing and promotions. "In the Trenches" correspondent Paul Green talks about an unusual, impromptu card sword to illustrate the benefits of quick thinking on your feet. "Financial Wizard" Eric Henning then chimes in with the fourth part of his very important series on covering your assets, this time about what to do when disaster strikes. Richard Robinson discusses the profundity of a simple "thank you" and David Acer revisits a book from one of magic's most influential personages which should be on your shelf already. Mark Zacharia offers his perspectives in "New Magic and Book Reviews" and finally in "Tricks for the Trade," Issue 64 offers two pieces from the publishers-a nest of boxes routine from Andrew Pinard and Jim Sist's torn and restored card with a surprise ending.